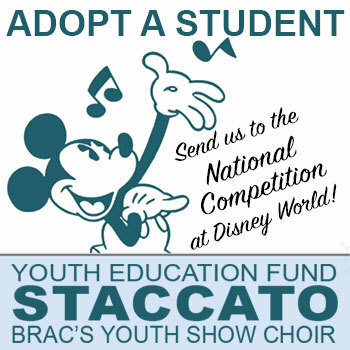 The Branson Regional Arts Council is sending our STACCATO Youth Show Choir to represent Branson in the National Show Choir Competition at Disney World this March 10-17, 2019. Our goal is to send each member of the choir on this once-in-a-lifetime experience free of charge to them. They have worked so hard to develop their performing skills, and we have no doubt they will make everyone in the Branson area proud of their achievement! Can you help make this Disney Dream Come True? Please make a tax-deductible contribution using a major credit card, or mail your personal check to: BRAC, Youth Education Fund, PO Box 2004, Branson, MO 65615.